Attention Lawyers: Are Your Clients' Sensitive Documents Secure? Cloud computing makes it easier than ever before for lawyers to take their offices on the road—to clients’ offices, courtrooms, hotel rooms and their own homes. But cloud computing places data—including client data in many instances—on remote servers, outside of the lawyer’s direct control, leading to ethical concerns related to attorney-client privilege and potential malpractice. 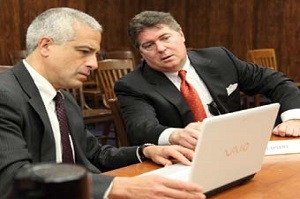 A lawyer’s newfound mobility clearly needs to be balanced with substantial security. The increasing use of cloud computing has led at least 14 different state bar associations to issue ethics opinions on their use and the American Bar Association to amend the Model Rules of Professional Conduct (MRPC) to address lawyers' use of technology and confidentiality requirements. All, at this point in time, permit attorneys to use cloud services so long as they exercise “reasonable care” to select a service provider that adequately safeguards client information. Popular cloud storage solutions, like Dropbox (which the ABA lists among the more popular cloud services for lawyers, but declines to recommend in light of security concerns), were designed as online collaboration tools; as such they offer a lower level of security than secure VDRs, which were designed specifically with security in mind. To learn more about how SecureDocs helps lawyers establish “reasonable care,” check out the full list of the product’s security features here. *Lawyers are advised to review their state’s specific ruling, as well as the ABA’s amendments to the MRPC that address technology and confidentiality requirements.